It’s been over three weeks now since the news came that Shirley Temple Black had left us. I’ve spent the time perusing her 1988 autobiography Child Star — refreshingly frank and thorough, if a bit starchy and formal. I’ve also been reacquainting myself with her movies, which was more than a little overdue; I haven’t seen most of her pictures since I was about the age she was when she made them. Some I’ve never seen at all. I’ll be posting on a few of those movies, because I think her career is worth reviewing in detail. But while I’m working up to that, I don’t want to let her passing go without some comment in the meantime. 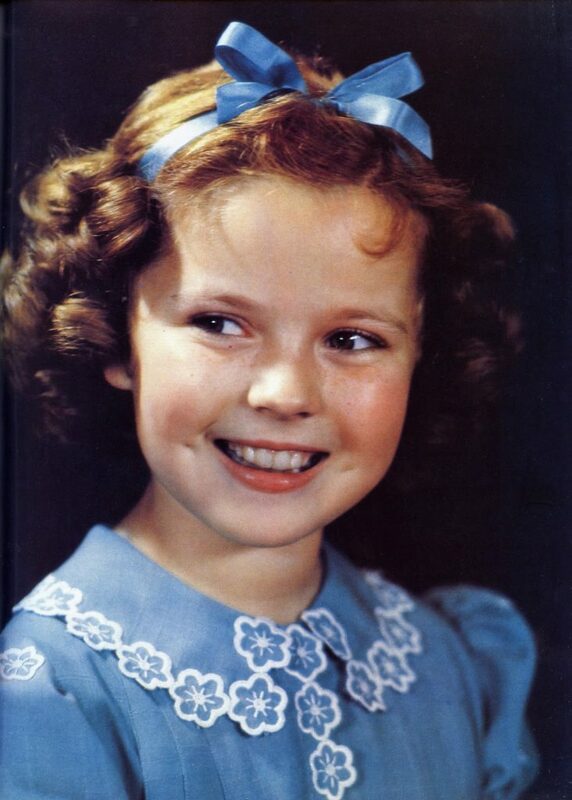 Shirley Temple was one of a kind. It may sound strange, but the comparison that sprang to my mind when I heard she was gone was with the Beatles, and not just because she appears in the crowd on the cover of Sgt. Pepper’s Lonely Hearts Club Band. Both were unprecedented showbiz phenomena that broke the mold. There were child stars before Shirley Temple (Jackie Coogan, Baby Peggy, Jackie Cooper), just as there were pop music sensations before the Beatles (Bing Crosby, Frank Sinatra, Elvis Presley). But these two — that one and those four — reached a level of popularity that dwarfed anything that had come before. There was simply nothing to compare them to. And they went beyond merely breaking the mold. They reset it — in their own image. Pop idols from ABBA and the Bay City Rollers to One Direction and Justin Bieber would all be called the biggest thing since the Beatles, but there never was a “next” Beatles. It’s been 80 years since Shirley Temple’s bit part in Stand Up and Cheer! made America sit up and take notice, and from Jane Withers through Freddie Bartholomew, Roddy McDowall, Margaret O’Brien, Bobby Driscoll, Patty McCormack, Hayley Mills, Tatum O’Neal, Drew Barrymore, Abigail Breslin — plus countless sitcom kiddies sprouting up along the way — there’s never been a “next” Shirley Temple either. My father once told me, “There were two bright spots in the Great Depression. One was Will Rogers, and the other was Shirley Temple.” In Child Star Shirley tells us that Rogers said they were set to make a picture together “when I come back from Alaska”, but of course he never did. After August 1935 Shirley would have to brighten the Depression all by herself. And that’s just what she did, in picture after picture, beginning with her bit in Stand Up and Cheer!, singing and dancing “Baby, Take a Bow” with James Dunn. It may be hard at this remove — for some, impossible — to grasp how this little girl charmed and cheered America just when the country seemed to be falling apart. But she did, and for three years she was the top star in the nation, if not in the world. Later, when — as it inevitably must — her box-office power began to wane, her personal popularity never did. Neither did the level-headed cheer that made up her on-and-off-screen personae. There was no descent into bitterness, drugs or alcohol, no pathetic scramble to cling to lost youth, no humiliating splash in the tabloids. A happy second marriage to well-to-do Charles Black helped, but even that might not have happened without the solid, no-nonsense upbringing she got from her mother. Gertrude Temple was the kind of woman who could have given stage mothers a good name — if there hadn’t been so few like her. She saw to it that little Shirley had a firm sense of self independent of her phenomenal popularity — and in time, independent of her mother. That’s why, when her movie career ended in 1950, Shirley was able to move on without a backward glance. The grace, confidence and poise instilled by Mother Gertrude served her daughter well through those early dizzy years and, more important, long after. They took her smoothly through, first, a second career in early television; then, surprisingly, a third career in politics and international diplomacy, as U.S. ambassador to Ghana and Czechoslovakia and White House chief of protocol; and finally, a long bask in the setting sun as a Dowager Queen of the Golden Age of Hollywood. I’ll have more to say about those first heady years in posts to come. For now: So long, Shirley, and thanks for the memories. We shall not look upon your like again. Girl and woman, Shirley Temple wore her gifts and her trials with equal grace. I look forward to your look at some of her entertaining films. Wonderful tribute to a remarkable girl/woman. Like you pointed out, she did not slide into substance abuse or cling desperately to her youth. She survived childhood fame, a bad marriage, cancer, and many other things. I admire her no end. Jim, it's great to see you back with JIM LANE'S CINEDROME, with your superb salute to Shirley Temple! Shirley was lucky enough to have a sensible mother to guide her. I also can't help admiring her ups and downs, including beating cancer and becoming an ambassador, among other things. I look forward to your upcoming blogposts on Shirley's life and times!